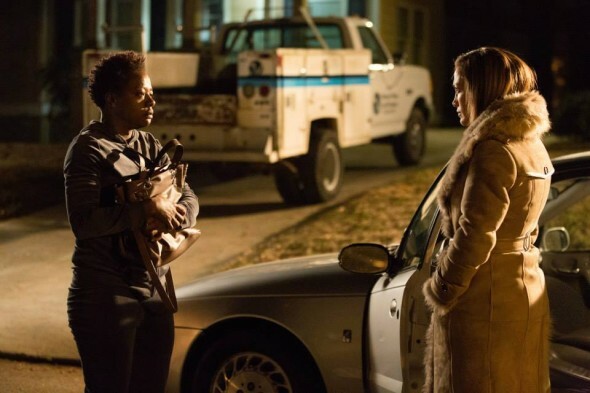 Two things land Lila & Eve on the big screen: one great lead, and one big twist in the script. Okay, maybe one and and a half things, because without Viola Davis, this is next week’s episode of CSI: Some Big City. Davis, truly one of the most gifted actors around, plays Lila, a single mother who loses her oldest son to stray bullets from a drive-by shooting. Struggling to cope, she joins the “Mothers of Young Angels” support group, where she meets Eve (Jennifer Lopez), who has lost a daughter. Eve doesn’t really have much use for the group’s advice, and both women are distressed at how little interest the authorities seem to have in helping them. So, they hit the streets, determined to do whatever it takes to uncover the lead their local detective (Shea Whigham) says he needs to move forward. The script is the debut for writer Pat Gilfillan, which is a fairly evident. There’s nothing original or seasoned at work here, as Lila & Eve is just a mashup of Jodie Foster’s The Brave One and another title I won’t mention for fear of spoilers. But really, that will only save you about the first twenty minutes or so, until the breadcrumbs to where the film is going start to glow like a bright neon exit sign. Director Charles Stone III (Drumline) sets an early pace that’s too rushed, leaving the ladies’ choice for vigilantism unconvincing, and the racial aspect of legal foot-dragging overly played. He slows down during the big reveal to let the drama resonate, but instead provokes an eye rolling disbelief at the notion we’ve been caught by surprise. It’s no surprise that Davis elevates the material. Lila’s grief and desperation both ring true, as does the delicate flirting with her neighbor Ben (Julius Tennon, Davis’s real-life husband). Lopez is passable, though she’s more naturally hamstrung by the weaknesses in script and direction, and has trouble moving Eve beyond a standard generalization. We’ve seen this movie before, almost note for note. There’s only so much that one superior performance can do, and Davis’s can’t save Lila & Eve.